The Magic Weight Loss Pill! You’ve seen the ads promoting pills and drinks that claim to make you lose weight easily without having to exercise and eat well. If any of these magical products actually worked, then everybody would be thin. As the old saying goes, if it sounds too good to be true…it probably is. We all want to be fit and fabulous with minimal or no effort while eating whatever we want, right? 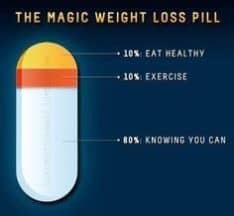 But unfortunately, there is no magic pill for weight loss. When we talk about weight loss, what we really mean is fat loss. To successfully lose fat your body has to burn more calories than you consume. Calories are a measure of the amount of energy provided by the food you eat. The more calories you eat and drink, the more energy you are putting in your body. If you put more energy (calories) in your body than it uses, then the extra caloric energy is stored as fat. One pound of fat is equal to 3,500 calories. So to lose one pound of fat in a week, your body has to expend 3,500 more calories than you consume (500 calorie deficit per day). To lose two pounds in a week, your must create a calorie deficit of 7,000 calories a week (1,000 calorie deficit per day). Experts agree that it is not advisable to lose more than 2 pounds of fat per week. Losing 2 pounds per week is a challenge for most to achieve anyway. Don’t be fooled – If you’ve ever tried a low-carb or no carb diet and lost several pounds in the first few days, you didn’t lose several pounds of fat. What you lost was a few pounds of water weight from your muscles. Carbs transport water molecules to your muscles, which are made up of approximately 75% water. So without consuming carbs, your muscles get deprived of water and go flat. This is why the rapid, large weight loss from not eating carbs stops after a few days. However, carb cycling is very effective for fat loss while also providing your muscles with the water they need. There are only two ways to create a caloric deficit: (1) eat fewer calories, and (2) exercise. If you want to meet your fat loss goals, you should start by comparing how many calories you take in with how many calories you burn every day. Add up your calories by keeping a daily food diary of what and how much you are eating and drinking. And yes, you have to count those little nibbles here and there – they have calories too. Then compute how many calories you burn during your entire day. We can help you compute your calorie expenditure with scientific formulas which take into account your specific body along with your daily activity levels and exercise. Exercise uses up oxygen, which causes your body to burn stored fat. It also strengthens muscles, which tones and shapes your body. The increased muscle mass boosts your metabolism, which means you burn more calories even after you stop exercising. Eat right and exercise and your body will have no choice but to trim down and shape up. Find a way to burn more calories than you take in and and you will lose fat with lasting results! There are advanced, scientific methods to optimize the effectiveness of your exercise and maximize your fat loss results in the shortest amount of time – join us in our PinkZONE classes and personal training for maximum results! Come see us and let us help you lose fat, shape your body and improve your health with lasting results!